Marco Minnemann is a unique artist. His music is always creative and innovative. Certainly it falls into the realms of progressive rock, but he’s not really content to sit in one place in that genre. Instead he works between heavier music, more melodic prog, Rock In Opposition and more. The most frequent comparison is modern King Crimson, but even King’s X is often a valid reference. A lot of the songs here are instrumental, but some have vocals. 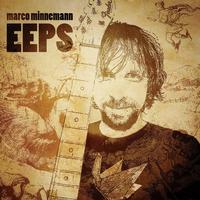 This would be a great introduction to the musical world that Marco Minnemann produces. It’s a unique one. Frantic drums start this. Crimsonian guitar fires in from there. Bits of electronic sound come into the mix as an intermittent rhythm section. Later electronic sounds come over the top as almost a symphonic icing. Those sounds take over as everything else falls away. There’s almost a DEVO like element combined with Rock In Opposition and something like King Crimson. Yet there are hints of surf music and some 1950s music here. This is weird, but oddly compelling and fun. This is one of the few songs on the album with vocals. The percussion track on this is pretty busy. There are lines of heavy guitar in competition with odd keyboards and other things on an arrangement that’s busy, but also rather intermittent. There are some almost metal guitar parts at times on this. The percussion on this is the real driving factor and it gets a lot going. Some weird keyboard chirps and bleeps are heard later in the piece along with some more melodic Crimson-like guitar work. Although this has the same freeform weirdness driving it as the rest of the disc does, there is a really heavy, almost King Crimson turns dark metal, vibe to it. The keyboards over the top temper it and bring it into some pretty amazing territory. This is one of the most accessible and powerful pieces here. It’s definitely one of the highlights to me. This is another that’s a bit more accessible. It’s got a cool groove to it. It’s King Crimson-like for sure. It’s a cool rocker. Minnemann works this through some shifts and changes. It’s high energy and very cool. While there is still a heaviness here, this is more of a melodic tune. It’s another with vocals. It’s a lot more mainstream than a lot of the rest of the music here. This is almost a pop song in some ways. There is still a definite “left of center” vibe here, though. Free form and weird, this is quite RIO in style. It’s also, oddly enough, got an almost accessible groove to it. There are King Crimson-like elements here, but this is weirder than that. There is a melodic section at the end. This powers in with a psychedelic rock goes King Crimson vibe. There are some non-lyrical vocals barely in the mix on this at times. It’s fuzz laden, noisy and also fun. Around the minute and a half mark it drops back to some mellower music and some processed vocals come over the top, not very audible. They are essentially synthesized and this section has a real electronic space music vibe. There’s sort of a smoking hot, hard rocking jam that takes over later. We get more traditional vocals. The whole thing drops down to a mellower mode after the first verse. The piece continues to evolve with mellower sections emerging and then heavier ones. At a couple points there is a cool twang-bar driven Crimson-like guitar movement. It also drops to an almost creepy mellow section after the second of those. There’s a percussion work out later, too with some spoken bits that feel more like found sound than anything else. This is a catchy number that’s fun. It’s really got an accessible vibe to it. It make me think if King’s X a bit, perhaps with some 1980s pop music thrown into the mix. An instrumental groove opens this, feeling like a King type of jam. By “King” type of jam, I mean that it feels at once like both King’s X and King Crimson. There is a more melodic movement later in the piece, too. This comes in very heavy. It’s got a progressive rock edge, but in a lot of ways the first riff feels quite metallic. As keyboards glide over the top later it gets a more pure prog sound. Eventually we’re taken out into a mellower motif for a section. That section, built out, eventually ends the piece. There is a definite metal vibe to this. That said, King Crimson is a valid reference point, too. It’s quite freeform and at times a little creepy. There are some frantic sections, too that seem to combine Dream Theater with Rush. This piece is very dynamic. It seems to be constantly in flux, shifting and changing. Themes arrive work through and end. Sometimes they return, other times they don’t. At points this is more of a straightahead rocker, particularly in a jam mid-track. Other times, though, it’s more off-kilter and odd. Weird voice samples open this and keep it “acapella” for a bit. Then a heavy rhythm section opens, bringing it in close to thrash. After going through in a fairly straight line for a time, it shifts to some seriously crazed RIO-like music. That ends the piece. This comes in with a more mainstream sound, feeling like a combination of progressive rock and progressive metal. This one has vocals along with some spoken samples. There are weird bits of sound here and there as this opening section runs through. Then it turns out to some heavy RIO like weirdness from there. More samples and things are heard over the top of that section. We’re brought back to the earlier section for another vocal movement. Then it wanders back out into serious weirdness. Space rock styled keyboards open this. Then some echoey, twang barred guitar joins and brings it forward tentatively. Those two sounds work together for a time, but then it drops back to extremely mellow, textural music with some picked guitar. Eventually that works out into a more melodic rocking sound to continue. Then we get a nicely off-kilter jam that calls to mind King Crimson. Vocals come in over the top as that continues. There is a definitely heavy metal style jam later. It works back out into mellower, intricate prog from after that section runs through. This is another song that includes vocals. The first of three bonus tracks, this is rather heavy, but also very dynamic and intricate. It’s a killer track. It moves out to a mainstream, high energy jam after a time. There’s a processed spoken introduction at the start. Then Minnemann launches out into a killer fast paced jam that’s a lot of fun. More spoken samples are heard over the top of this. We’re taken through a number of shifts and turns and some of this sounds a lot like modern King Crimson. A more melodic movement with the processed spoken voice returned takes over from there. We move out into the harder jam after a while, though. Noisy, but also dramatic and intriguing, this is another that makes me think of modern King Crimson quite a bit. It drops to a short, slow moving, noisy space section at the end.